As individuals we are all unique, if not all equal in talent or, especially, recognition. We all have a different Tale to tell. I actually believe that if any two people are paired up, there will always be one thing that one excels at over the other. It could be playing the violin or getting that damned fourth screw in or out of a piece of furniture! So, I write. As I’ve often said, I didn’t realize fiction was something I could do until I had a reason to write. I enjoy writing fiction and I guess a few people have enjoyed reading my stories, although I don’t think ‘best seller’ is in my future. But, as Buddhists believe, the DOING is the thing, not the result. It may not be the Western way of thinking, but all of us engage in activities for pleasure that we enjoy, even if our piano playing won’t get us on stage at Carnegie Hall, or our painting into the Museum of Modern Art. Over the next couple of weeks and from time to time I’d like to share some of my avocations besides writing. I always enjoyed singing. In high school and college I did some Broadway, some choral work and was in a small Madrigal group (my favorite madrigal BTW was Orlando Gibbons’ ‘The Silver Swan’). Anyway, as I got older (as in really OLD, on Medicare–you know) the classical repertoire became more difficult, so I began to sing rock. 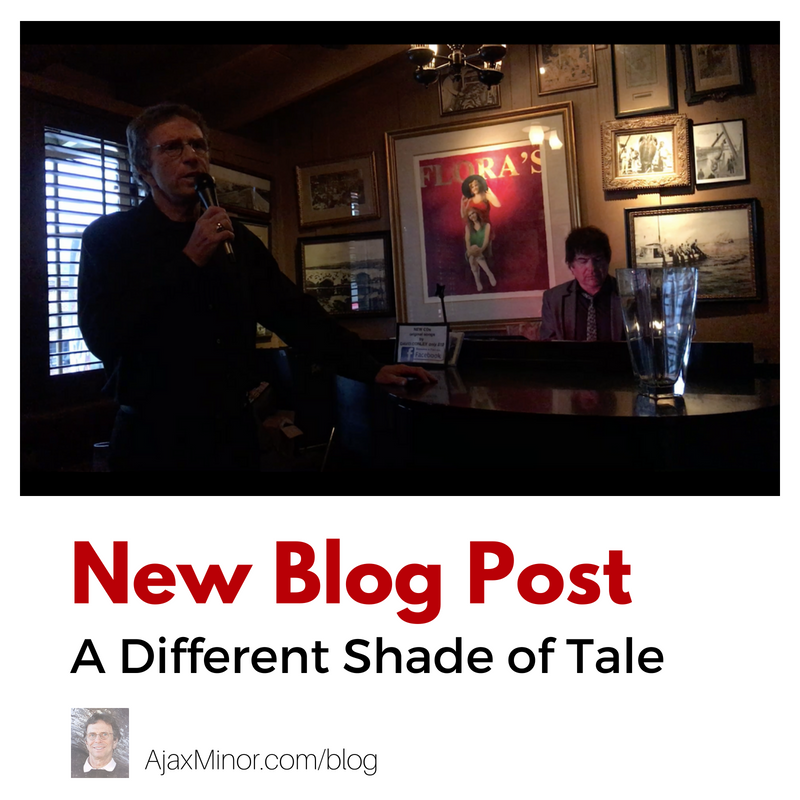 Check out my debut at Sardine Factory in Monterey, CA recently doing ‘Whiter Shade of Pale’. Performance, whether on stage or publishing literature, means totally exposing yourself and it can make you feel very vulnerable. I was a bit nervous at first at the Factory but got some mojo going. Such a wall flower Paul.. How wonderful to get out there and strut your stuff.. yeah! U r no Wallflower Red. Just a beautiful blossom. Hope u enjoy the stories if u decide you read them. Very cool being in touch! Well done Paul. I look forward to connecting at the reunion. Back at you on the 50th!